Every day we are inundated with news articles about a driverless future. By now, we know autonomous vehicles are coming, the question is not if but when. Yet most articles only focus on two basic topics: the technology itself and the safety concerns. Only a few touch on the urban effects of this technology. These opinions tend to fall into two camps: Either driverless cars will exacerbate the ills brought by the private automobile – a suburban dystopia – or become a way to fix them – an urban utopia. Both positions recognize the disruptive potential of this new technology. It is undisputed that driverless vehicles will change people’s behaviour, and with it, how cities move, function and feel. Not since the last reset – the advent of the automobile in the early 20th century – have we had the opportunity to reshape the places we live. Yet, the two positions’ predicted outcomes could not be farther apart, and we know that both cannot come to fruition. Which one is more likely to happen: Utopia or dystopia? Rather counterintuitively, the answer to this question lies not in the driverless car phenomenon itself, but in how it will link to the wider dynamics of the mobility ecosystem. Our new video details the wider impacts that driverless vehicles could have on our urban regions. If you consider driverless cars only on their own, chances are that they indeed will produce the bleak urban future scenario. People will be able to live further out, making the negative effects of sprawl even more acute. Traffic will get worse, not only because of longer commutes, but also because owners can choose to have their cars circle around empty instead of paying for parking (or driving back home unoccupied). Congestion will not matter anymore, because people will be able to use their time for other activities. Pollution will likely increase, unless they are powered by alternative energy sources. A major displacement of jobs and houses may happen. Municipal tax revenues could collapse or move to other jurisdictions. But it doesn’t need to be that way. Driverless cars aren’t happening in a vacuum. Three important urban mobility developments are occurring in parallel: A transit renaissance, the rise of shared mobility, and the emergence of on-demand technologies. These three trends are driven in different proportions by changing demographics, growing demand for urban living and walkability, the aspiration for a higher quality of life, the need for affordability and convenience, and a heightened end-user experience. We recently completed a report that draws on an array of IBI expertise to identify the potential gains and pains a driverless future may create. In isolation, these three components do not have the power to effect a reset of our complete mobility model. True, new light rail lines (transit) can move the needle towards compact, mixed use development, but they are costly, take years to build and impact metropolitan areas only in patches. True, ridesharing services such as Lyft Line (shared mobility) are space-efficient, but need coordination, require enough passenger demand, and are less convenient than the private automobile. True, Uber and similar services (on-demand technology) have revolutionized the taxi industry, but these cannot move as many people as efficiently and cost-effectively as transit. If on-demand hail services were the only choice in cities, the congestion problem would be even worse. Imagine driverless cars that do not need to be owned by each household, but can be used by many (shared mobility). Instead of investing in a car, you only pay a fraction of the cost, and you don’t have to drive. Imagine these cars bringing people to transit stations (rapid transit), and then picking up other people for the ride home. Instead of needing parking at the station or your destination, the vehicle makes another trip in a small area, without congesting highways. Imagine an app that allows for real time pickup anywhere with pricing integrated in your transit ticket (on-demand technology). Instead of figuring out how bad traffic will be or how much the taxi fare is going to be, you know that you always have mobility at your fingertips. The result? A system that is safer, cleaner, faster, cheaper, more convenient, and requires less land for highways and parking. Space that can be repurposed for other uses: urban agriculture, affordable housing, community spaces. In other words, the idea of urban living that most people would agree with. Initial studies, such as this one by the OECD, show that this integrated approach would substantially reduce congestion and parking when driverless cars arrive. 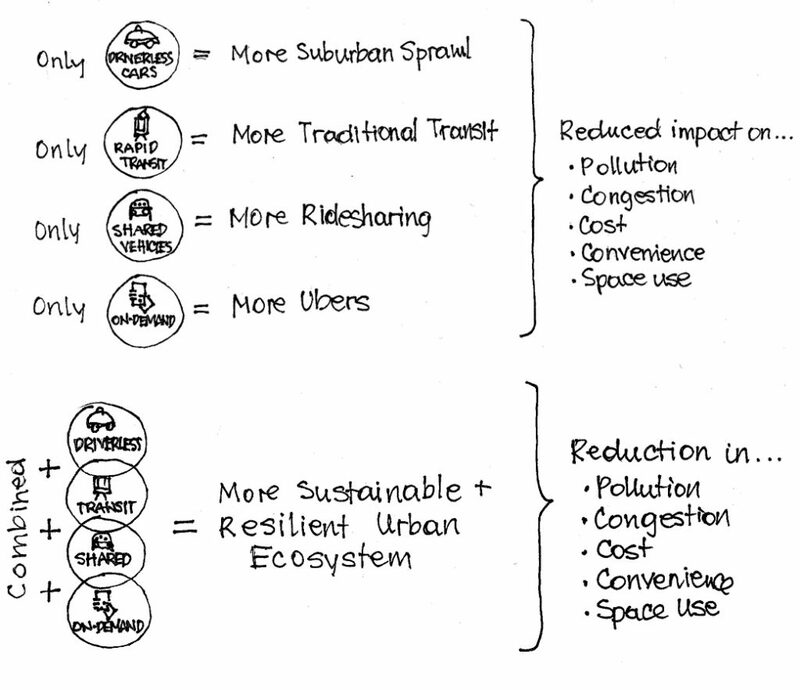 Importantly, this future is also applicable to low-density suburban settings, as we’ve argued before. Functional and fare integration of private sector transit-on demand services with public transit, including incentives for provision of driverless car-sharing as first-last mile provider. If driverless cars – owned by one person, used by one person, and controlled by one person – are just left to happen on their own, the positive scenario outlined above will not be the automatic outcome. Actually, we have been there before: We let the disruptive technology of the 20th century, the private automobile, set the pace without thinking about the systemic effects and the unintended consequences. We even helped with a substantial dose of public subsidies. But this time around we can do better. Will we?